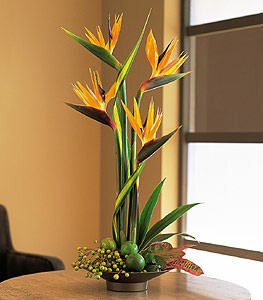 If youre looking for a touch of the tropics, this bird of paradise arrangement will heat up any home or office. Four birds of paradise, along with chinaberries, limes and green leaves arrive in a simple wok-style bowl. Note: This item may require 24 hours notice in some areas.